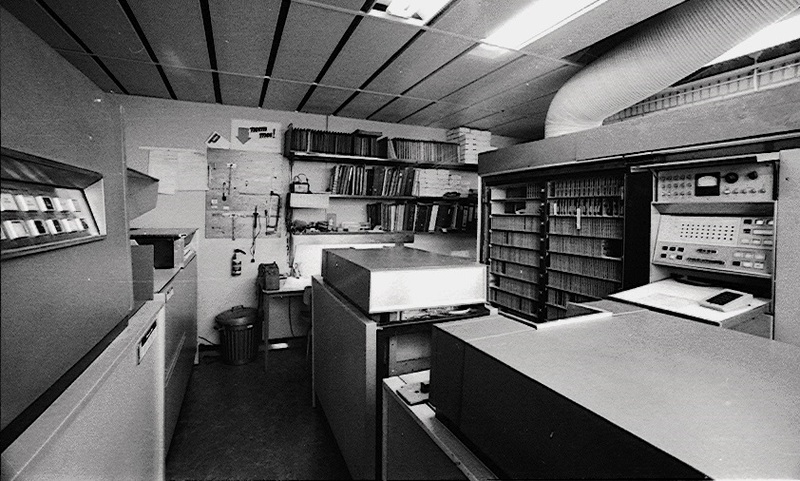 The Univac Solid State Computer 90, The Read-Punch-Unit. and put the card into one of the two output-bins. Data could be punched into prepunched cards. read the fourth, punched the third, check-read the second and lay down the first that entered the device. The Read-punch-unit could read and punch 150 cards per minute. one before the punching and one after, and write these card-images into the buffer. The instruction 22 0820 0505 then tested whether the read-station-buffer already had been written. On a yes the instruction 46 3800 0560 would transfer the two card-images from the buffer to the 3800 band. The instruction 57 0000 0590 selected the card just red in the second reading-station to fall into bin 2 the next cycle. Not selected cards ended up in bin 1. Programming the Read Punch Unit was complicated since the program had to interact with the five positions of the cards. To simplify this, Univac had provided punch-routines to be incorperated into the programs. because then they were easier to handle, and was used to duplicate data-files. In programs it punched aggregated data in cards to be used by succeeding programs. a payment-list was printed and at the same time, cards were punched with financial-data for accountancy and for the project-administration.